George Orwell conjured up his nightmare world of malicious bureaucrats engaged in pernicious mind control in his novel, 1984. At the time 1984 hit bookshelves in 1949, it was largely taken as a warning; directed at avoiding a future dominated by a malign few, at the expense of a pliant and gullible many. As the Iron Curtin descended across Europe, many took it as an analogue of the “how to” manual used by the Iron-Fisted, Communist regimes that ran the Soviet Bloc. These days – as the great “Greenblob” (just the latest tribe of Neo-Marxists hell-bent on destroying free-market democracy from within) infects every aspect of political life and society – his prescient insights have taken on the air of a hard-hitting political documentary: in the institutional corruption that follows the wind industry wherever it goes, it’s clear that Orwell’s future is now. Orwell’s tongue wasn’t exactly wedged in his cheek when he coined terms such as “newspeak”; “doublespeak”; and “doublethink”: he was in deadly earnest. “Doublethink” involves ordinary people simultaneously accepting two mutually contradictory beliefs as correct; but differs from plain old hypocrisy and neutrality. Somewhat related but almost the opposite is “cognitive dissonance”, where contradictory beliefs cause conflict in one’s mind. Doublethink is notable due to a lack of cognitive dissonance — as brainwashing renders the “doublethinker” completely unaware of any conflict or contradiction. And, so it’s come to pass that those that purport to govern us, fight tooth-and-nail to bury the facts about the insane costs of wind power; and, when the facts get out, take to lying and obfuscation like ducks to water. In Orwell’s dystopian vision, the Party spent its every energy to ensure the people knew nothing of what was really going on, ensuring that only a narrative approved by the “Ministry of Truth” saw the light of day. When it comes to energy policy, Ontario’s Big Brother mind control network is under the firm grip of the apparatchiks from the Ministry of Environment and Climate Change and the Ministry of Natural Resources and Forestry. A band of lunatics who, under the spell of Kathleen Wynne, have systematically destroyed everything that was once half decent in Ontario. Rocketing power prices – killing its manufacturers – and tens of thousands of these things killing rural communities, as to their peace, prosperity and cohesion are just some of the consequences of being over-run by the wind-cultists who have wrested malevolent control of every aspect of daily life: economic, social and environmental. Fitting within their ‘doublethink’ world is the naked hypocrisy that sees all manner of creatures crushed, carved up, sliced and diced as the natural consequence of blind idolatry. In the following pieces, in a victory against the Inner Circle, a group of real environmentalists have managed to stave off disaster for thousands of migratory birds that use the shoreline of Lake Ontario as a nesting and feeding ground. But it wasn’t the inevitable mincing of flocks of birds that led to an outbreak of common sense, it was the threat of a rare and endangered turtles being squashed by vehicles – that would have traversed the network of roads within the proposed wind farm. The Blanding’s Turtles’ existence is so precarious that the Environment Review Tribunal had no choice but to can the project. Much to the delight of turtles and their human benefactors. 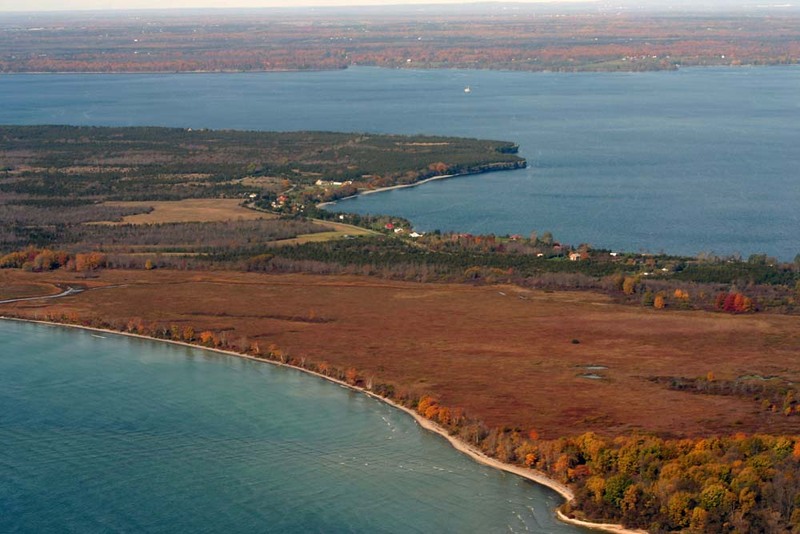 An Environmental Review Tribunal has, for the second time, revoked the permit of a wind developer seeking to build nine industrial wind turbines at Ostrander Point on Prince Edward County’s south shore. 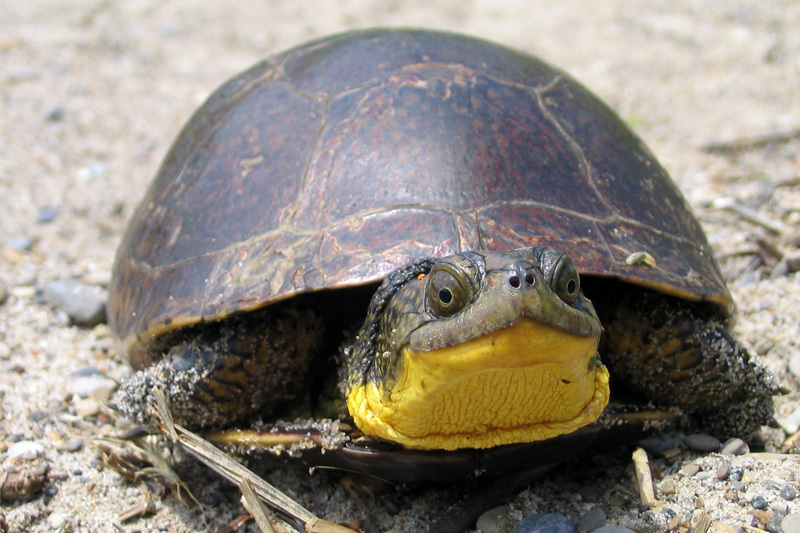 The Tribunal, consisting of Robert Wright and Heather Gibbs, found that measures proposed by the developer to reduce the harm to the Blanding’s turtle, an endangered species in Ontario, likely would not eliminate the threat posed by the project and its road network. It concluded that fencing and other control measures proposed by the developer might reduce the threat to the Blanding’s turtle, but would not eliminate it. 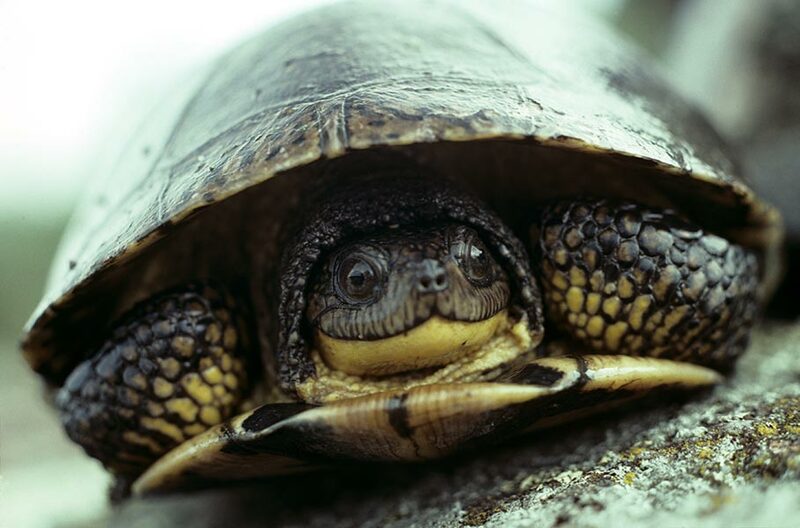 It found that over the lifespan of the project, even a small number of turtle deaths posed an intolerable threat to the species—given the Blanding’s turtle’s long life and low reproductive output. “No doubt that this case is now precedent setting on a number of different levels,” said Eric Gillespie, legal counsel for Prince Edward County Field Naturalists (PECFN), the organization that launched the appeal in 2013 and has battled through a variety of legal settings. Gillespie says the decision will guide future decisions, such as the White Pines remedy hearing, in three important ways. The judgement, he says, enunciates clear protection for an endangered species. It says that while renewable energy policies are important— but don’t trump other environmental polices—a balance must be struck. It also brings back the precautionary principle— that governments and their agents may weigh the relative risk of acting without a complete picture versus avoiding the risk altogether. “These factors alone will make this decision truly precedent-setting,” said Gillespie. Opponents of the project are thrilled. “This decision vindicates everything we’ve said since the beginning,” said Myrna Wood, of PECFN. “The province’s renewable energy policy doesn’t automatically override the public’s interest in protecting against other environmental harm,” said Wood, quoting the Tribunal decision. PECFN also underlined the critical importance of the Tribunal’s recognition of the precautionary principle, pointing to the following statement in the decision. “As our understanding of the way the natural world works and how our actions affect it is often incomplete, [government] staff should exercise caution and special concern for natural values in the face of such uncertainty,” wrote Gibbs and Wright in their decision. It is likely to be analyzed and picked apart by legal scholars and counsel for many years. Just days before Christmas in 2012, the Ministry of the Environment announced it had enough information to grant Gilead Power Corporation a permit to build a nine-turbine industrial wind project on Crown land on the County’s south shore. The project was appealed to the Environmental Review Tribunal. It was a long shot— no wind project had been derailed by a provincially appointed Tribunal. Besides, the test was impossibly narrow. Appellants had to prove this project would cause serious harm to humans living nearby. The only other available appeal was that the project posed a serious and irreversible threat to plant life, animal life or the natural environment. Despite the long odds, the Association to Protect Prince Edward County took on the human health appeal. PECFN went to bat for nature. After 40 days of hearings in the spring of 2013 and examining more than 180 exhibits of evidence, the Tribunal—Wright and Gibbs— concluded that no causal link between the proposed turbines and the health of nearby residents had yet been established. They denied that appeal. They found, however, that the risk to the Blanding’s turtle was simply too great and that the mitigation measures proposed by the developer were untested and likely inadequate. In July, they revoked the developer’s permit. The developer appealed to the Divisional Court in 2014. It ruled in favour of the wind company, arguing the Tribunal ought to have given the developer an opportunity to propose remedies to the issues raised by the Tribunal. Another appeal judge later overturned the Divisional Court’s ruling, but said the Tribunal would have to hear and render judgement upon the developer’s proposed remedies. Those hearings took place last fall in Demorestville. It has taken six long months for the ruling. The developer proposed to protect the Blanding’s turtle in two ways—keeping turtles off the roadway and limiting traffic on roadways where turtles might cross. But the Tribunal concluded that neither approach was likely to be effective. The Tribunal was persuaded that creating artificial nesting grounds might attract some Blanding’s turtles, but on their own, these artificial zones wouldn’t prevent the animals from criss-crossing the project area as they’ve done through the ages. More problematic is that Blanding’s turtles like to lay eggs in gravel—on the edge of roadways. And the developer was proposing to build 5.4 kilometres of new roadway in the centre of the turtle habitat. The Tribunal noted that Blanding’s turtle experts Frederic Beaudry, Kari Gunson and the Ministry of Natural Resources and Forestry’s Joe Crowley all agreed that the measures proposed would reduce mortality but would not eliminate it. Given the turtles’ long life and low reproductive rate, they concluded the project could not proceed. The story likely doesn’t end here. The developer has the right to appeal this most recent decision to the Divisional Court. What does the Ostrander decision mean for White Pines? Now that an Environmental Review Tribunal has ruled for a second time that an industrial wind project at Ostrander Point may not proceed because it threatens the survival of the Blanding’s turtle, many are beginning to ask what this decision means for another, larger industrial wind project surrounding the Ostrander Point site. The White Pines project comprises 27 wind turbines stretching from Milford, south toward the South Marysburgh shore, around the Ostrander Point site, reaching the edges of the Prince Edward Point National Wildlife Area. The Tribunal ruled in February that the project would cause serious and irreversible harm to the Blanding’s turtle and the little brown bat. But unlike the Ostrander Tribunal, Valiante and Wilkins did not revoke the developer’s Renewable Energy Approval, pending a hearing to consider possible remedies that could mitigate the harm to these species. That hearing has not yet taken place. According to Eric Gillespie, counsel for both the Prince Edward County Field Naturalists (PECFN) on the Ostrander appeal and the Alliance to Protect Prince Edward County (APPEC) in the White Pines appeal, the Ostrander Tribunal understood they were writing a precedent setting ruling. APPEC’s Orville Walsh is equally buoyed and relieved by the Ostrander Tribunal decision. “We believe that this decision will have an impact on our appeal of the White Pines project,” said Walsh. “The Tribunal itself has also said as much in that they had allowed more time for submissions with the knowledge that this decision was about to be released.” He notes that both projects are similar in nature, issues and geography. “The Ostrander decision touches upon several areas that also should apply,” said Walsh. “Specifically, the protection of an endangered species—the Blanding’s turtle and their habitat. This changes everything. The decision by two Environmental Review Tribunal members to deny a developer from constructing nine industrial wind turbines on Ostrander Point, in Prince Edward County, this week restores limits to a bad law and puts boundaries between the Wynne government and the natural world—particularly endangered species. There is, once again in Ontario, meaningful protection for creatures that our government is willing to kill in the name of green energy. Ostrander Point was always a bit of an over-reach. There is scarcely a more rugged and undeveloped stretch of shoreland on Lake Ontario than what lies between Points Petre and Traverse. It is perched in the middle of perhaps the most important migratory bird pathway in North America. Jutting into Lake Ontario, Prince Edward County presents an important resting place for birds preparing for or completing a lake crossing. Its wild shores provide the essential ingredients of life for a surprisingly diverse range of animals, birds and plants. The alvar landscape defines a rare and special habitat that deserves protection. We used to care about such things. It mattered that the frailest creatures around us might be teetering on extinction. We took steps to ensure we didn’t purposely and knowingly contribute to their demise. We believed that we shared this planet with other living things. So we established rules, regulations and laws to safeguard the most vulnerable. We taught the importance of natural ecosystems in school. We illustrated the fragile bonds that link the amoeba to our food supply and the interconnectedness of the natural world. We understood these things once. But then we became frightened. We were told the end was coming. Human activity was over-heating the planet and threatening our species, and our beach houses. Now it was personal. How quickly we chucked our pretense for caring for the natural world. In 2009, then Premier Dalton McGuinty, driven by equal parts arrogance and fear, enacted the Green Energy Act—a vile and poisonous bit of legislation. Its primary goal was to eliminate the barriers to industrial wind and solar energy in the province. Developers and others insisted that McGuinty eliminate safeguards and protection established over decades. There was simply no other way to scale up to the thousands and thousands of industrial wind turbines the Premier dreamed of erecting across Ontario. The Green Energy Act removed decision-making for these projects from local government. It diminished the Ontario Energy Board’s ability to guide the development of the province’s electricity system. No ministry was untouched. Each was ordered to fall in line and get out of the way. Nowhere was this edict imposed in a more Orwellian contortion of purpose than inside the Ministry of Environment and Climate Change and the Ministry of Natural Resources and Forestry. These folks know the consequences of their actions. They know that when they sign a permit that enables a developer to harm, harass and kill an endangered species, they are doing something very bad for the beasts they have been entrusted to protect. To care for. The Prince Edward County Field Naturalists (PECFN) knew this too. So they have fought back. For four years, they have battled the province and its ministries in a series of hearings and court rooms. Arrayed against a phalanx of lawyers representing the government, the developers and the industrial wind energy sector, PECFN has argued for mercy for the most vulnerable in the natural world. We don’t have to exterminate other species to salvage our own. We don’t have to ravage nature to protect our notion of the planet. We don’t have to diminish the well-being of our neighbours in our clumsy and ill-considered attempt to man-age the weather. This week, Heather Gibbs and Robert Wright drew a line. A line that had nearly been erased by the McGuinty government and the Green Energy Act. The Tribunal adjudicators ruled that the development of renewable energy doesn’t override the environment. They have made it clear that endangered species are deserving of meaningful protection—that no government ambition, noble or otherwise, can obliterate that. Further, the Gibbs-Wright decision injects some much-needed humility into the discussion of the natural world and our role in it. They acknowledge that our knowledge of the forces shaping nature is incomplete. Yet our government signs pieces of paper that give licence to kill an already-weakened species—a species we know to be vulnerable. This is shamefully reckless. The Gibbs-Wright decision now instructs future Tribunals to consider the principle of precaution—to weigh the risks of development versus walking away—not with certainty, but with the understanding that we can’t know the full consequences of our actions. “…[government] staff should exercise caution and special concern for natural values in the face of such uncertainty,” wrote Gibbs and Wright in their decision this week. It took six months to write this decision. It still must be defended—and vigorously so. It restores, for the first time in seven dark years, basic protection for the creatures we would discard in the name of saving the planet. It is a turning point. Not just for turtles, bats and whippoorwills but for communities in Prince Edward County, Amherst Island and elsewhere in rural Ontario. By enunciating these principles and establishing these precedents, Gibbs and Wright have restored some balance to the debate between those who seek to safe-guard nature and a powerful government that sees nature as expendable. You can come out now. It’s time for celebration. The idiocy of wind turbine nonsense in Ontario boggles my mind. Not very long ago I read that Ontario got 60% of its electricity, reliable and clean, from refurbishing an (I think) expanding its CanDU reactors, and 20% from hydro, having very successfully driven coal out of business. Worse than that, Ontario’s own Terrestrial Energy company, and its IMSR, has a design that has not the response hysteresis of ceramic fueled reactors, so all this nonsense about wind being a “renewable” resource is no longer significant (as if it ever was). Here in Australia our Planning Authorities AND the Environment Protection and Biodiversity Council – take note – you have a role to play in protecting the environment in ALL its forms. Mitigation is not the answer PREVENTION is. A huge victory in a gigantic, deadly-serious David and Goliath struggle, where the Ontario Liberals have on their side an evil, anti-human, anti-democratic law that they wrote for themselves and their corporate cronies. The corrupt Green Energy Act is justified by a massive UN-led scientific deception, the big global manmade climate change lie devised to rationalize the UN’s 1992 Agenda 21, and now the 2030 Agenda. These UN plans aim to inventory and control everything and everyone, to erase national sovereignty and democratic freedoms, to de-industrialize and de-populate, and to rule by fiat and diktat with an unelected, unaccountable centralized global government. The Ontario Liberals have been and continue to be an important foot soldier in this scheme—slowly, implacably implementing the nefarious plans in slavish obedience to the UN globalists. These industrial wind turbine things are just one manifestation of the crazed globalist agenda being forced on Ontario and other parts of Canada and the world. The UN’s effective tactic has been to gradually co-opt just about every institution and organization affecting the people, including government, mainstream media, education, big business, and, highly relevant to this case, ENGOs. Formerly worthy environmental groups that once did good work are now cheerleaders, enablers, facilitators, influencers, “social justice” blackmailers for the anti-human UN agenda. That is why we haven’t seen any traditional bird groups or ENGOs oppose the terrible slaughter of birds and bats by these industrial wind turbine things, or highlight any of the other terrible environmental carnage caused by them. It has taken a grassroots, local organization to fight tirelessly for years on behalf of an endangered species such as the Blanding’s Turtle, and mirabile dictu, they have for now prevailed against all odds. We in Ontario are indeed living in an Orwell’s worst nightmare. Resistance and opposition must become a way of life if we are to take back and preserve our democratic heritage for the next generation. 1. When technologies are imposed which have not had the proper checks and balances carried out there are, and will be, consequences. 2. When governments refuse to acknowledge or act upon peer reviewed reports warning of problems arising, in favour of advice received that ‘all is well’ from the wind power industry and vested interests – those consequences become patently more serious and unacceptable. 3. The environment is suffering via water contamination caused by turbines constructed on water catchment areas, and habitat loss. 4. When the responsibility to ‘First do no harm’ adopt the precautionary principle and protect the electorate they were elected to serve, is ignored – the results of those failures will come home to roost. 5. Those currently in power overseeing the status quo on energy policy will not escape future legal challenges as evidence of corruption and harm caused grows. There are of course other such consequences which others may like to include….please do. Sites like this do a great service in informing the public globally of the true picture.